Home » Community » Who are the CCCLDMSG? 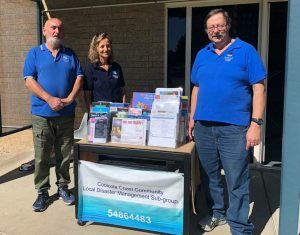 The Cooloola Coast Community Local Disaster Management Support Group is made up of community volunteers, members of Emergency Services, Gympie Regional Council and other Service Organisations within the community, covering Rainbow Beach, Tin Can Bay, Wallu, Goomboorian and Neerdie. Our group uses local expertise and associations with other organisations to initiate responses and immediate disaster management at the community level. We operate from an office within the Cooloola Cove Community and Veterans Hall and are contactable during an emergency on 5486 4483. 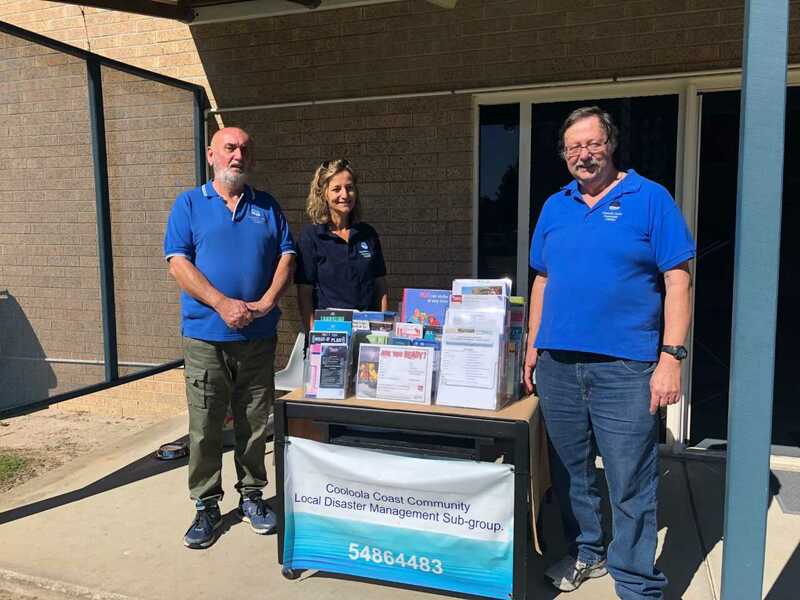 Check out our information boards at the Dolphin Shopping Centre and Woolworths, Cooloola Cove for information on how to prepare for an emergency or see them at the markets, like this image of Chairman Terry Steele, Colleen Hair and Secretary Kevin Somerville at Cooloola Cove. Our next meeting is on September 4 at the Cooloola Cove Veteran and Community Hall, all are welcome to attend. If you would like more information please contact CCCLDMSG Chairman Terry Steele on 54864483 or visit our information stand at the Cooloola Cove monthly markets.